Surface and Interface Chemistry of Clay Minerals, Volume 9, delivers a fundamental understanding of the surface and interface chemistry of clay minerals, thus serving as a valuable resource for researchers active in the fields of materials chemistry and sustainable chemistry. Clay minerals, with surfaces ranging from hydrophilic, to hydrophobic, are widely studied and used as adsorbents. Adsorption can occur at the edges and surfaces of clay mineral layers and particles, and in the interlayer region. This diversity in properties and the possibility to tune the surface properties of clay minerals to match the properties of adsorbed molecules is the basis for study. 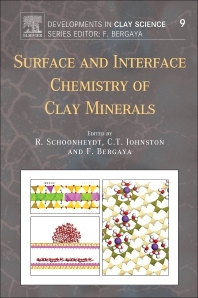 This book requires a fundamental understanding of the surface and interface chemistry of clay minerals, and of the interaction between adsorbate and adsorbent. It is an essential resource for clay scientists, geologists, chemists, physicists, material scientists, researchers, and students. Emeritus Prof. Robert Schoonheydt obtained an engineering degree in chemistry and agricultural industries from the KU Leuven (Belgium) in 1966 and his PhD in agricultural sciences in 1970. He was for one year a post-doc in the chemistry department of Texas A&M University. From 1971 until 1989 he was researcher of the National Science Foundation of Belgium and became full professor of the KU Leuven in 1989. His research interest was concentrated on the surface chemistry of clay minerals and zeolites. He was dean of the Faculty of bioengineering science from 1998 till 2004. He was secretary-general of AIPEA from 1987 till 2001; from 2001 to 2005 he was AIPEA president and became fellow of AIPEA in 2013. Cliff Johnston is a Professor of Earth, Atmospheric and Planetary Sciences and Agronomy at Purdue University, West Lafayette, Indiana USA. He serves as a Deliberate Innovation for Faculty Director at Purdue University. His research program focuses on the surface chemistry of clay minerals and related environmental particles. Most of his research of focused at the ‘molecular scale’ where he examines the molecular mechanisms of processes occurring at the mineral-water interface. He has published over 144 journal articles, book chapters and edited books. He has served as President of The CMS (Clay Minerals Societies) and has received numerous awards. He has been invited to give keynote lectures at several conferences and collaborates with researchers throughout the world. Dr Faiza Annabi-Bergaya obtained a Licence-ès-Science in Physical-Chemistry from the University of Tunis in 1966, a first PhD in Inorganic Chemistry in 1971 from University La Sorbonne-Paris VI and a second PhD in Physics in 1978 from the University of Orleans (France). She started her career in 1971 at the CNRS from which she is presently Emeritus Research Director. Her research interest is focused on the Physics and Chemistry of clays and clay minerals. She is member of the AIPEA Nomenclature Committee. She was Secretary of the ECGA in 1999-2003. As President of the GFA (French Clay Group) in 2003-2007, she created the annual meetings of the GFA, organizing the first two meetings in Orleans. She launched the Series Developments in Clay Science with the publication in 2006 of Volume 1 (Handbook of Clay Science) and she is Series Editor since 2013. She is Editor-in-Chief of Applied Clay Science since 2012.